It was a pleasure to see the article entitled Meaford Landscape Designer Awarded Contract in The Meaford Independent. 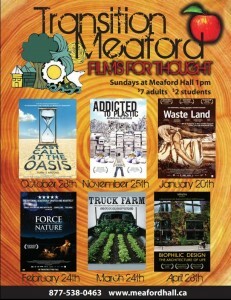 It suggested that the Films for Thought; environmental and social justice series at Meaford Hall is on track. The series is starting a second run of 6 documentaries, from October 2012 to April 2013, all designed to spark discussion around the issues of healthy humans integrated with a healthy planet. Urban Roots was on the big screen at Meaford Hall, Sunday past. It documented the revival of community and hope that grew out of the shocking impact of the food desert left in the wake of Detroit’s post-industrial economy. Corporations, now seeing an opportunity, want to ‘urban farm’ for profit; oblivious to the companion need to strengthen the social fabric of community through farming activities. No longer ‘flying under the radar’, Detroit Urban Planners will be required to make decisions that accommodate this 21st century, post-industrial phenomenon. 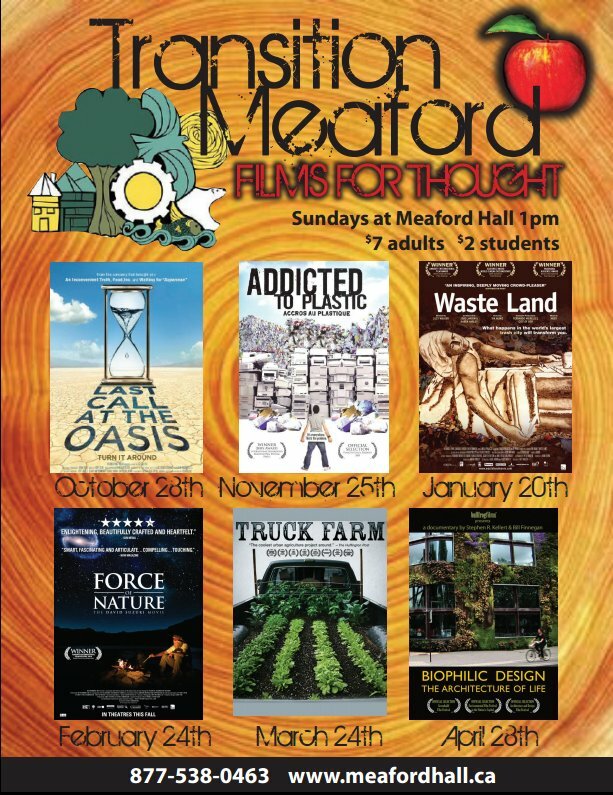 New and special to Meaford is the beginning of a yearly film series entitled Films for Thought, presented by Transition Meaford. In the spirit of community collaboration; Meaford Hall, The Meaford Independent, Evolve Toy Store and Transition Meaford connected to move this idea to the big screen. Six consecutive Sunday afternoons starting May 20th, Films for Thought will offer movie goers a chance to further develop a critical perspective on global events and ones’ role in nurturing their local community. Details of the Sunday afternoon Films for Thought series will be re releasing in Meaford Hall’s spring publication (released May 11th). Tickets are purchased through the Meaford Hall box office: Adult $7.00, Student $2. E-mail the Films for Thought poster to your friends!